Snacks can be an issue for those of us following the Ketogenic way of eating. Pork rinds are crunchy and delicious but there aren’t many alternatives for when you just want something different. This recipe is fantastic because the final flavor mimics a popular brand of cheese flavored baked snacks. This recipe is insanely simple. Preheat your oven to 300 degrees. Take your thinly sliced cheese slices and slice them into four quarters. You can make as many chips as you’d like to have at once being mindful that cheese is very calorie dense and some varieties still contain carbohydrates. 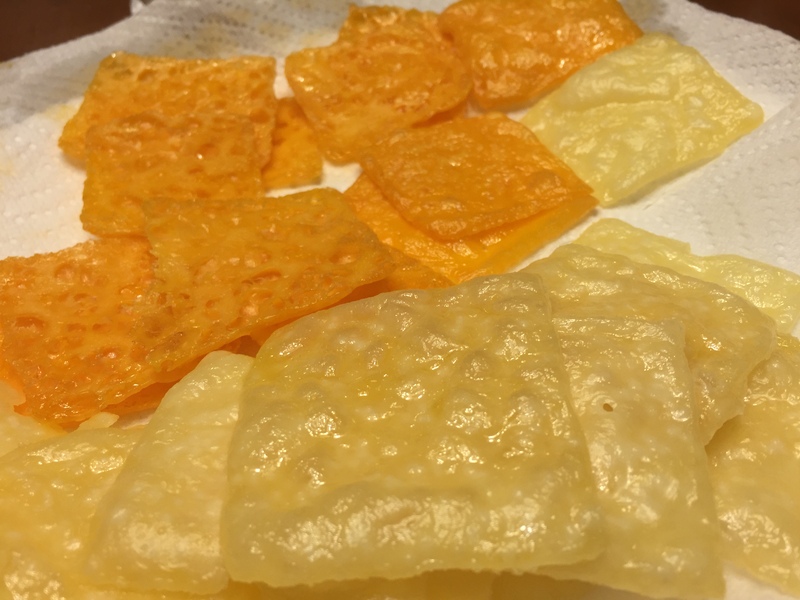 Place your silpat on a baking sheet and place the cheese quarters directly on the silpat. I’ve seen some other people use parchment paper for this recipe and that’s how I tried it initially. I don’t recommend this because they will definitely stick to the parchment. It’s a real pain to get them off. (Update: Apparently I’ve been using parchment paper all wrong according to my readers. If you like parchment then go for it! I personally like using a silpat because it is reusable and convenient to use!) The silpat (Artisan Silicone Baking Mat, 16.5 x 11 inches) is non stick and they slide right off. Dust your cheese slices with a small amount of lite salt (Mortons Lite Salt) to your taste. Some people may find the cheese salty enough without doing this however. Place your baking sheet full of cheese in the oven for 30 minutes. If they start to brown around the edges they’re probably done. Place the baked cheese on paper towels to absorb the extra grease. They’ll be soft while they’re warm but as they cool they’ll crisp up more. Enjoy! Caloric Information Will Vary Depending on the Brand and Type of Cheese Used. Refer to the Manufacturers Packaging.